It’s a beautiful day for a bike ride. We cannot get over how quiet it is. 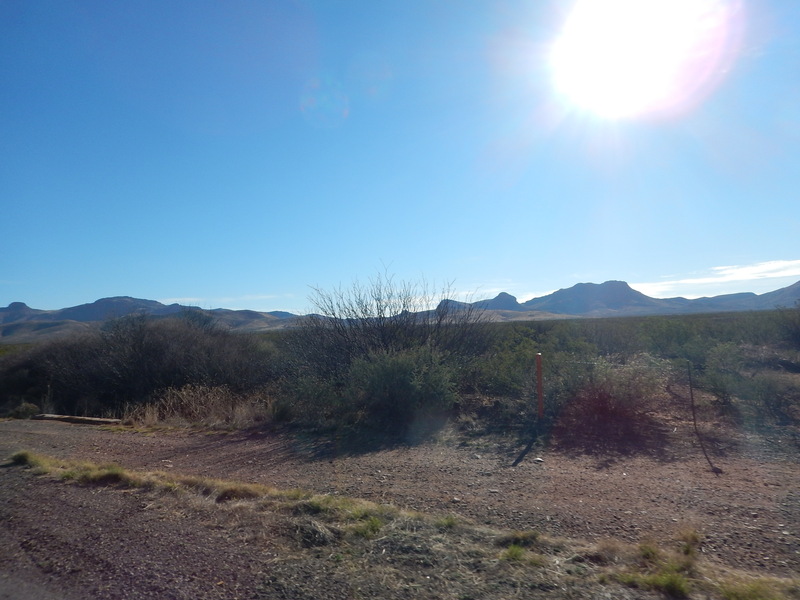 We start our ride just before 8am and there are no cars on AZ-80 this morning. There is no wind as we negotiate the 1 or 2 percent grade. Once again the scenery is spectacular. Sometimes we feel like we are in a Disney park and the mountains are excellent set decoration! These mountains are different because they have rock out-croppings. It’s a big day as we leave Arizona, our second state line crossing. 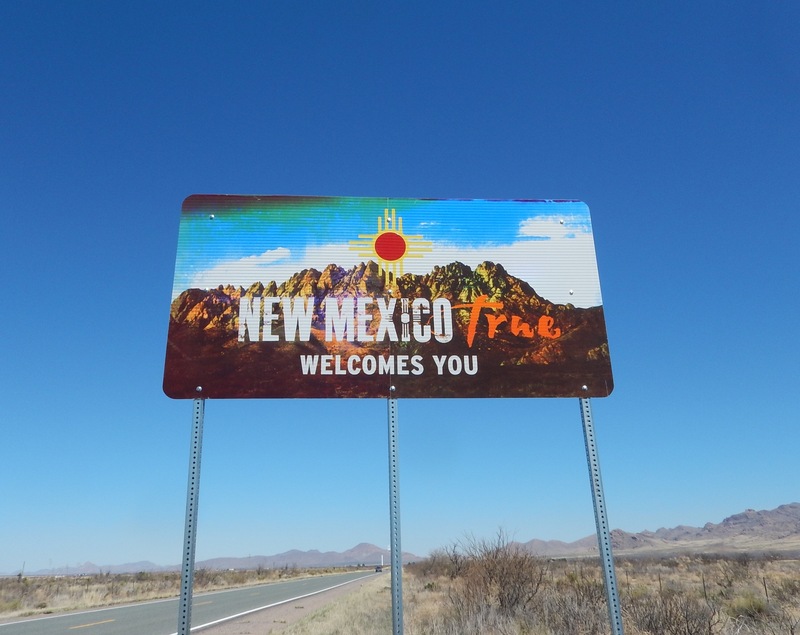 We celebrate with photos and enter our third state, New Mexico, our friend Mitzi’s favorite state! 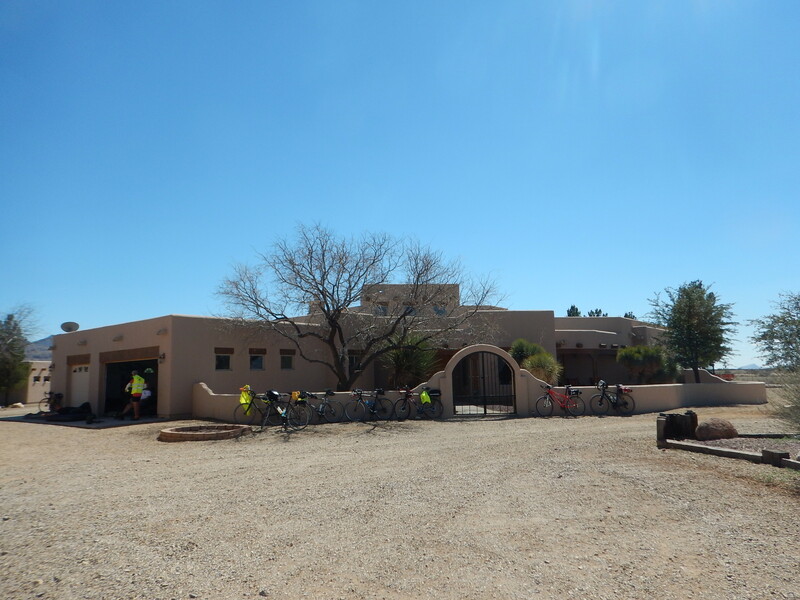 The accommodations are very impressive, but the final 3 miles of the route are on unpaved road and we have to walk much of the way because of unsafe riding conditions. We are staying at The Painted Pony Resort in Rodeo, NM. It’s hard to believe it’s even here. Apparently, the McAffee virus software guy built this house before he allegedly killed someone in Belize. There was a drawing for rooms (which we were not a part of) and we hit the jackpot with the master suite in the main house. Fancy bathroom, glass doors out to the patio with pool and hot tub! Do we have to camp anymore? Tomorrow: A ride we have been dreading for over a year. 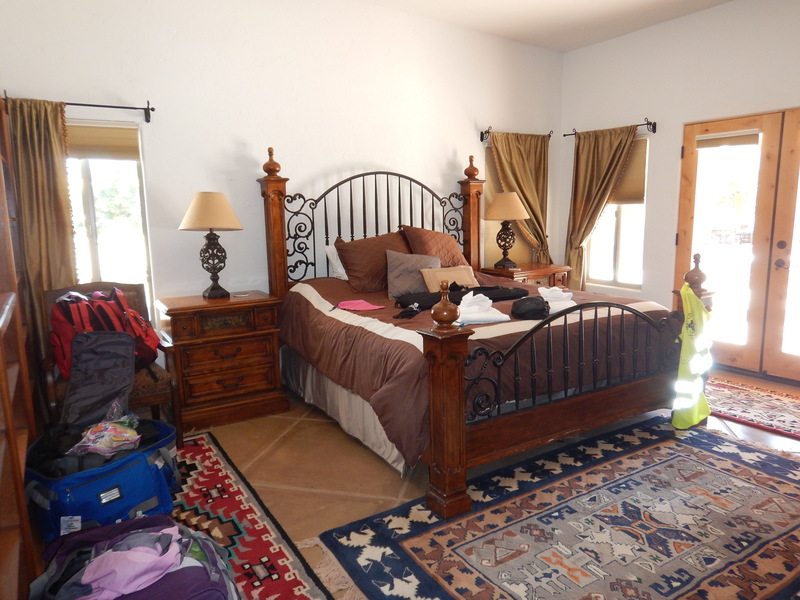 Looks like there is a dog sprawled across the bed… More likely an animal pelt though! So you started at 8, and rode a little over 3 hours. Does this mean you were done at noon and able to relax the rest of the day? 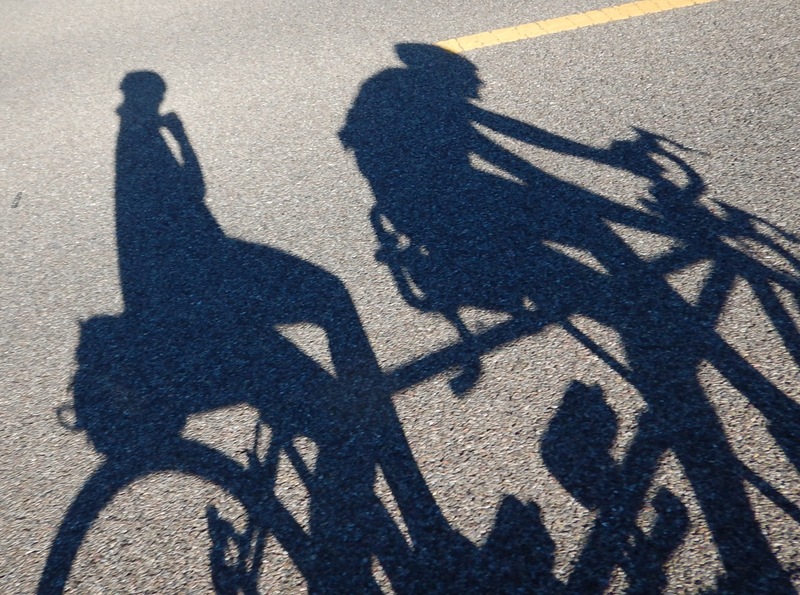 How many of the 25 riders you are with ride Tandem? Sounds like the difficult part of your adventure is accompanied by hotels. This is the 3rd night, right? A little over 3 hours of ride time, but there is rest time, and there was an early lunch stop AND it got an hour later when we crossed the border. We stopped the bike computers when we had to walk through the sand and gravel. It was 1:50 when we started the unpaved part. We got to the house at about 2:30! There was plenty of time for relaxation (and blogging)! There is only one other tandem (our Canadian friends). No traffic start is a nice gift. You left us with a teaser….Tomorrow! If there isn’t an update….. Walking in the heat and sun is awful! Good job, guys, you are our heroes. Enjoy your wonderful room and bathroom, looking forward to the next posts. Following you every day. Looking good you two! Thanks for the photo! Are those 4-foot-by-4-foot tiles in that bedroom?! BTW – awesome first picture. travel “twogether” . Nice ending to that bike walk! Last year (16) most of the guys stayed in the airplane hangar,and had a mouse visited just as we fell asleep! 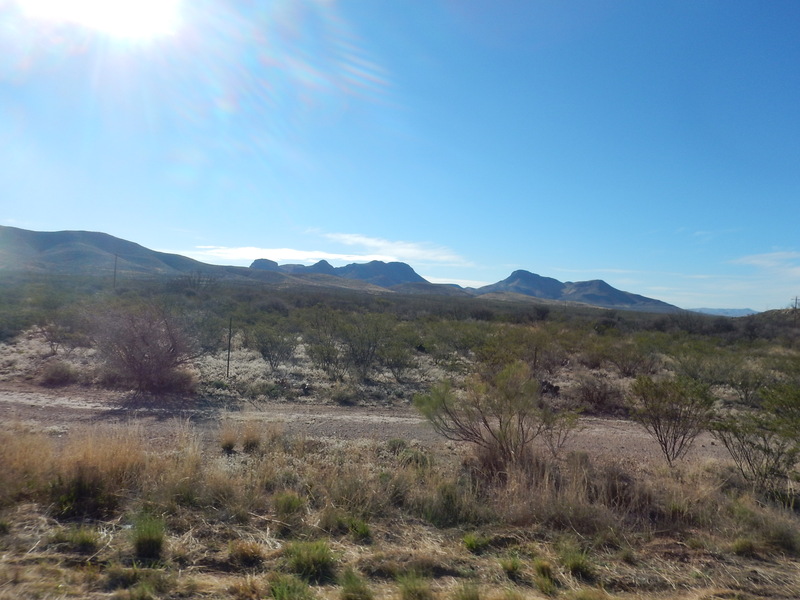 Some fantastic photos and I love New Mexico as well. Great scenery. Bet that hot tub felt wonderful. Been cold and gross here. (BTW they started putting in the new cable lines yesterday). 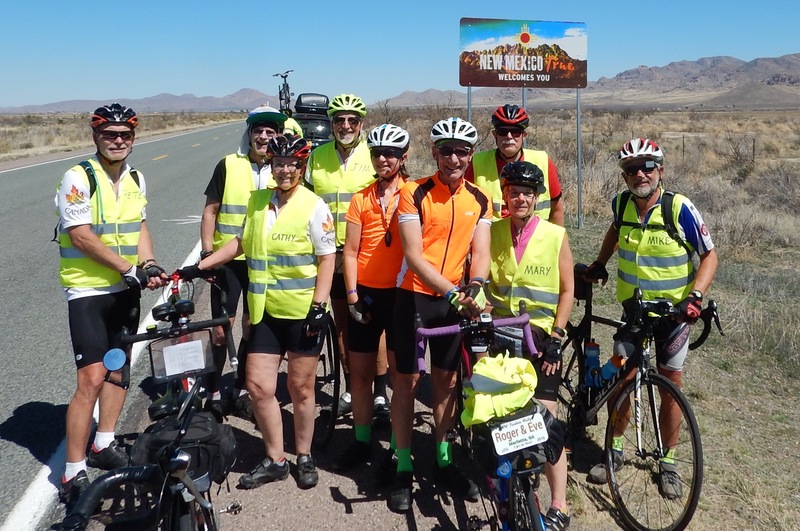 We’ll be cycling in New Mexico in September with Adventures In Tandem. So, your pix are a great preview. Thank you for all the wonderful descriptions/pics of YOUR adventure! No 3/17 post? Hope everything is okay.